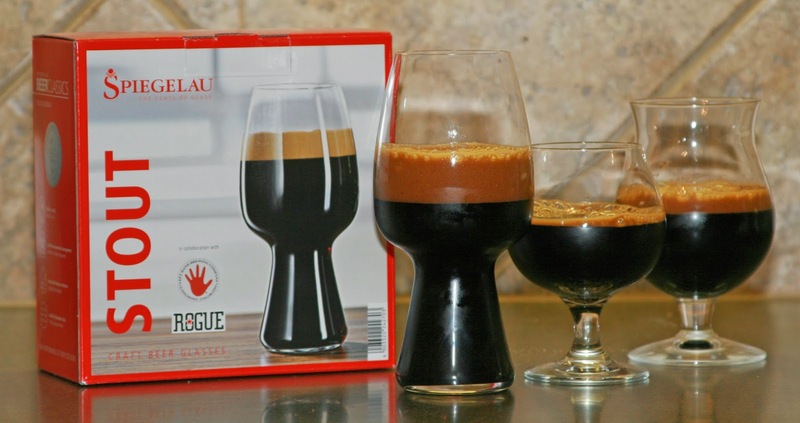 This past April, glassware-maker Spiegelau announced the launch of the "world's first stout-specific beer glass," a drinking vessel designed in collaboration with Oregon-based Rogue Ales and the Left Hand Brewing Company of Colorado. As was the case with the successful release of their IPA model in 2013, Spiegelau took a similar approach in determining the makeup of the new glass. Hundreds of different shapes were evaluated over the course of a year, with taste testers narrowing down the choices to a number of prototypes before selecting the glass that would ultimately go into production. Curious to see if Spiegelau's newest creation delivers on the promise of a more profound stout-drinking experience, I along with Matt Dixon of Dallas Brew Scene obtained samples from the company in order to put the product through its paces. Appropriate test subjects were chosen, which for me meant a bottle of Great Divide's Chocolate Oak Aged Yeti, while Dixon opted for a classic in the form of Founders Breakfast Stout. Compared to its predecessor, the Stout glass has a similar, though more voluminous shape than that of the IPA design. Its fuller fashioning allows it to hold just over ten percent more liquid than the IPA glass with a capacity of 21 1/6 oz. This makes for a rather weighty pour considering you can nearly empty the contents of a 22oz bomber into the glass. Surveying the incurved rim at the top, the diameter measures 2 1/4 inches. This exactly matches that of the IPA glass, and is also on par with the incurved rim of a 10 oz snifter. Not surprisingly, like the snifter this design serves to concentrate aromas more so than say the outward flare of a tulip glass. Taking note that this effect is among the many touted features of the glass, at least in this case it would appear to live up to expectations. In terms of other elements, product literature claims the "wide, conical bowl" provides "superior flow" to the palate "improving the taste, mouthfeel and finish of a complex stout." While we are both on board with the liquid delivery portion of that statement, some may find that the idea that it helps to "improve" the taste is somewhat harder to swallow. There's no disputing the clarity of the glass, though, as the "ultra pure quartz material" would seem to provide the "true color" appearance it promises. Thinking about the drinking experience as a whole, honestly it doesn't seem all that different than what can be had with a snifter (my choice) or a Belgian globe glass (Dixon's choice). That said, the only downsides we can see with Spiegelau's product might start with the price, though at roughly $20/pair (at Amazon.com) it doesn't seem all that exorbitant compared to other "proper" glassware. Another minus might be that the Stout glass is no less dainty than its IPA brethren. Packaging boasts "improved breakage resistance," but we'd still recommend careful clinking.